This page shows the 'Reekie's' pot originating from London E.
The 1901 Census records the existence of the Reekie family and that Thomas Reekie is stated as being employed as a lighterman. 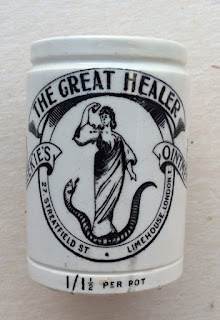 The connection to the production of the ointment is unclear but it is likely that the wife of Thomas Reekie, Catherine Reekie, prepared the ointment. The pot itself carries a super pictorial of a lady standing on top of a snake. The base of the pot is marked with MAWS. book produced by Messrs. Houghton & Priestley, page 117.